Krunal was exceptional with the ball as he returned with the figures of 3/28. Team India has finally managed to win a T20 International against New Zealand. The Eden Park in Auckland was the venue where the Men in Blue put their best forward to level the three-match series. This is the third time on this Trans-Tasman tour that the visitors have come back after losing the first game and will be hoping to win the series now. After opting to bat first, New Zealand were slow to get off the blocks. 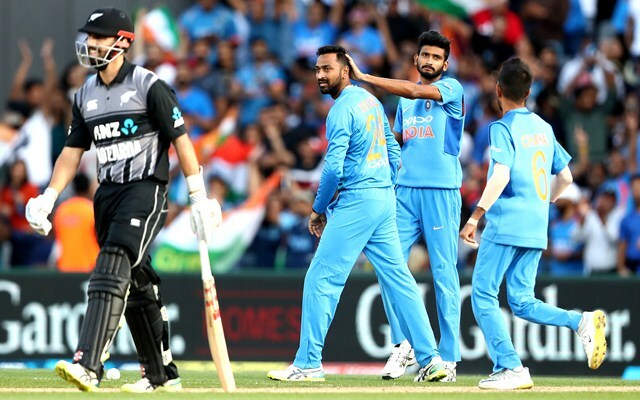 Bhuvneshwar Kumar swung the new ball and eventually got better of Tim Seifert after which Krunal Pandya broke the back of the Kiwi batting line-up. He accounted for two scalps in a single over and stalled New Zealand’s progress early. Though there was a huge controversy regarding Daryl Mitchell’s dismissal, one has to credit Krunal for bowling really well. Krunal also pinned Kane Williamson plumb in front of the stumps to reduce the hosts to 50/4 in the eighth over. But Colin de Grandhomme came out all guns blazing to lead his team’s revival. He and Ross Taylor stitched a partnership of 77 runs for the fifth wicket as the former also slammed a half-century. He was dismissed exactly on 50 off only 28 deliveries and then India once again had an upper hand in the proceedings. Eventually, New Zealand could only post 158 runs for the loss of eight wickets after 20 overs with India conceding only 31 runs after De Grandhomme’s dismissal. Rohit Sharma got going almost immediately in the chase. His trademark shots off the short ball were literally a delight to watch for the 42000 spectators at the Eden Park. He took the charge in the opening partnership as Shikhar Dhawan was struggling to middle the ball. Rohit, in the process, also became the first Indian player to hit 100 sixes in the T20I format. He scored 50 off just 29 balls as Ish Sodhi broke the 79-run opening partnership. Rishabh Pant and Dhawan then continued to play smartly not taking many risks. The latter’s struggle, however, was ended with a pacy bouncer by Lockie Ferguson. Dhawan scored only 30 runs off 31 deliveries with a couple of boundaries. Pant, however, played his shots and looked comfortable batting at three. Vijay Shankar couldn’t make the most of the opportunity and managed to muster only 14 runs. MS Dhoni brought calmness to the proceedings, in the end, to remain unbeaten on 20 off 17 balls. Pant scored the winning shot which raced to the four and stayed not-out on 40 off 28 balls with four fours and a six as India gunned down the chase with seven balls to spare. Why don’t India pick Rishabh Pant for ODIs if MS Dhoni is being pushed up the order? Young, fearless and explosive. Rather than going with the pedestrian Dinesh Karthik.